In its thirty year history the Sports Stadium proved to be a magnet for visiting personalities to Brighton. 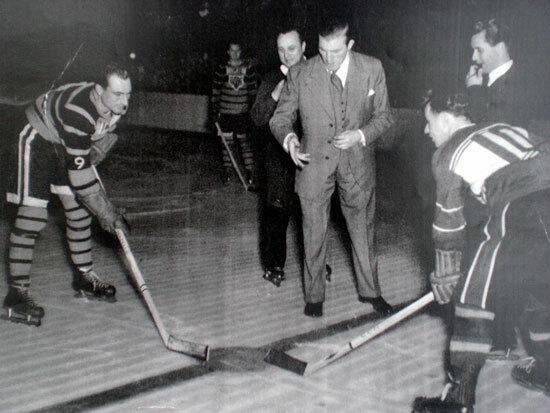 In its heyday celebrities made a bee-line to meet and greet the most famous ice hockey team in Britain and enjoy the thrills and spills of the fastest games in the world. On match days it was not unusual to see three or four celebrities in the VIP box cheering the team to victory. As an added bonus on many occasions they would present the winning team with a trophy at the end of the match, much to the delight of the roaring home crowd and visiting fans! 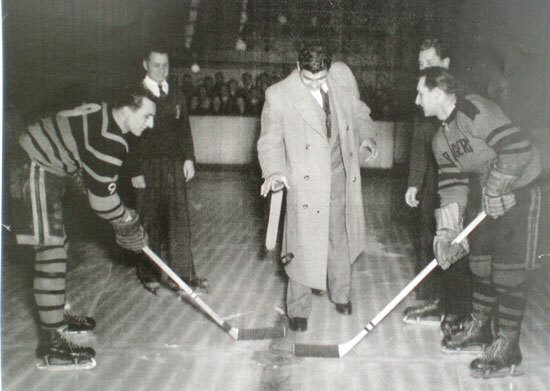 Many of the celebrities were regular visitors to the rink and included, Charlie Chaplin, Betty Davis, Houdini and Sabu the Elephant Boy. 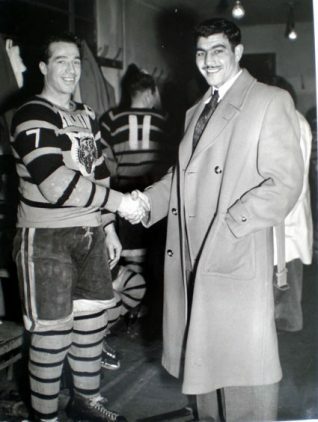 Sporting stars were too numerous to mention but one of the Tigers most ardent fans was local resident Tommy Farr, the Heavyweight Boxing Champion who fought Joe Louis. Jack Gardner was born on November 6th 1926 in Market Harborough. He was a sergeant in the Grenadier Guards when he won the Army Imperial Services and the ABA heavyweight title in 1948. In the same year he also represented Britain in the Olympic Games held in London at Wembley Stadium. The London games were the first to be shown on home television although few people actually owned sets in those days. Gardner turned professional in November, 1948 and won his first of 13 fights inside the distance before losing to the Canadian heavyweight, Vern Escoe. He was beaten again by Escoe in February 1950, but went on to defeat Johnny Williams in a British and Empire heavyweight title eliminator. He then went on to take these titles from Bruce Woodcock in November, 1950. Gardener forced the champion to retire in the 11th round. 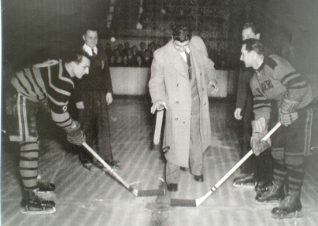 Jack was rather a slow mover but had a good left hand and this helped him to take the European title from the Austrian, Joe Weidin in March 1951. Gardener disappointed his supporters by losing to the German, Hein Ten Hoff in September 1951, this cost him his European title. In March 1952 he also lost his British and Empire title when he was out pointed by Johnny Williams! Disappointed at the result he retired not long after. Finally in 1954-55 he made a come back and beat Johnny Williams by knocking him out in five rounds in a British and Empire title eliminator, unfortunately he was finally beaten by the Empire champion, Joe Bygraves, in the April of 1956. Jack Gardener was a regular visitor to Brighton, his training headquarters in the town was the well known boxing gymnasium behind the ‘Crown & Anchor’ pub, in North Road, Preston Village. Jack Gardener died at the age of 52. Great story Trevor. Now I know what took place at the Stadium all those years ago! Jack Gardner was in the Coldstream Guards not the Grenadiers and he only reached the rank of private. I was in the same battalion. Jack Gardner was my uncle and I can confirm that he did reach the rank of Sgt. Hi Garth, you have an interesting uncle. Did Jack Gardner every marry or have children? Do you know how tall he was? I am researching boxers named Gardner and Jack Gardner was a great boxer. He was never actually knocked out throughout his career and had five one round knockout victories. He looks related to me and I would like to know more about him. Jack Gardner was in the Grenadiers as he was my grandfather’s best friend during this time. They were both in the Grenadier boxing team together. Jack had a son and daughter. He was one of three brothers – all were great boxers, only Rod Gardner survives. Do you know how tall he was? Most of my Gardners were about six feet tall. Jack Gardner was one of the greatest punchers in the heavyweight division. I didn’t know he had brothers who were boxers, but I have heard of John L. Gardner, who never lost a title fight. Hi Garch’s mom, I don’t know if we are related, but Jack Gardner does look related. I have already researched my family tree. I’m American and it goes back to the 1700s in South Carolina. I myself am from Louisiana. I also find other Gardner families interesting. I am said to have descended from a Scotsman, but some say we were Irish and some say English. What is your email address? My email address is lonewolfcg@aol.com and I would love to find out if we are related. I would also like to find out more about Jack Gardner. I have plenty of information about my interesting family history, although the 1700s is a bit sketchy, but I could possibly make it clear if I am connected to your family. Hi Terri, My father, Robert (Bob) Smith, also knew and boxed with Jack in the Guards. What is your grandfather’s name, maybe my dad remembers him as well? Another fantastic write up Trevor! 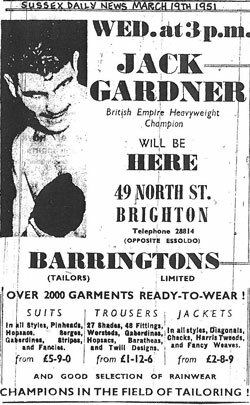 A photo of Jack Gardner, dressed in a Barringtons jacket, was used in their advert in the Brighton Hippodrome programme for Frankie Howerd’s review “Starry Way” for the summer of 1951. It was obviously taken at his appearance in the shop in March 1951 as per your cutting. Hello. I am Siobhan, Jack’s brother Bob’s, granddaughter. It’s great to hear about my family tree. More information would be great. I went to school with his son Jack. St. Joseph’s RCA School, Market Harborough. We played together too. I fought Jack Gardner in Feb 1948 at the Slough Community Centre, and yes he was a Sgt. in the Grenadier Guards. He knocked me out in the first round, and on the same evening knocked out “Tiny” Joe Harding in the first round. Joe was a Grenadier also, me I was in the Life Guards Regt. I met Jack Gardener’s son John to-day. We had a lovely chat about his dad and what a great fighter he was. Could you please give John Gardner, son of Jack Gardner, my email address, at GardnerCA89@aol.com. I am writing a book that mentions his father. All the best. I am a grandson of a Rod Gardner, I started searching for some history today because he is not far from passing away now. My grandad has always been the strongest but most gentle man I’ve ever known and, thanks to him and Gran, we had amazing summers visiting them in Wales. If anyone wants to know who he, Jack or Bob were then in happy to tell a few personal accounts – as well as a few stories from my Grandad.